Trump Campaign Manager Corey Lewandowski went on FOX News Sunday this morning. 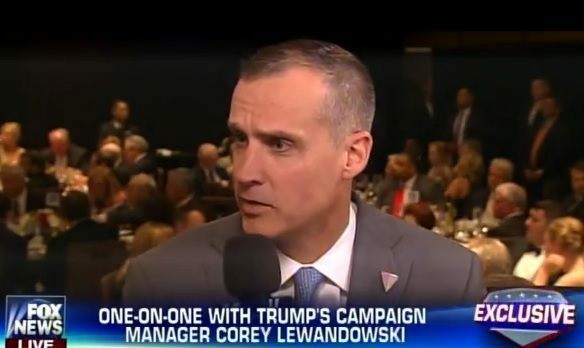 Lewandowski dismissed criticism of the Trump campaign after the Cruz camp nabbed all of the delegates in Wyoming Saturday in a voter-less contest. Cory explained that the Cruz campaign does better with party bosses who write the checks. Lewandowski told “Fox News Sunday” that the Trump campaign indeed comprehends the rules — which vary among states and sometimes apply to conventions, not primaries or caucuses. Nevertheless, he thinks the rules are not always fair. “We understand what happens,” said Lewandowski, arguing primary challenger Texas Sen. Ted Cruz does better in state contests in which “party bosses pick the delegates,” not the voters. He added: “There are people out there who don’t have the ability to write a check,” to become a convention-picked delegate. Trump, Cruz or Ohio Gov. John Kasich will need 1,237 delegates to win the Republican Party nomination. Lyin' Ted Cruz can't get votes (I am millions ahead of him) so he has to get his delegates from the Republican bosses. It won't work!